Models can be used to elucidate patterns within and amplify information in datasets. Team members have experience building models based on inputs from specialists in other speciality areas (e.g. tropical ecology and coastal zone management) to perform spatial analysis and make sense of raw data. Case Study: Predictive modeling with sparse data. 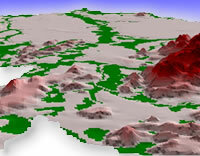 Georeferenced tree surveys and Digital Elevation Model (DEM) were combined to form a spatial model using ArcView and SPSS. The loosely-coupled, unbiased, spatial model combined well-founded components of GIS and multivariate logistic regression and risk-reduction with the known ecology of a Greenheart (chlorocardium rodiei). The output was a map of the 3,700 sq. km study area predicting the most probable areas for finding Greenheart - the major timber export and an endemic species of Guyana. The results were tested against independent field survey data and achieved a classification accuracy comparable to other landscape analyses. The study demonstrates the integration capability of GIS and the potential of using spatial models for transforming sparse datasets into information needed by planners and managers.